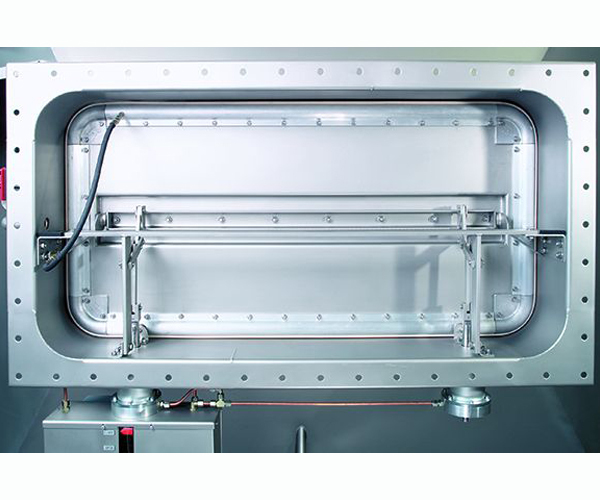 Krantz has developed the gastight, rectangular shut-off damper, type S, for use in ventilating systems with high requirements in regard to tightness, e. g. in nuclear facilities, laboratories, etc. The shut-off damper consists of a damper housing, a hinged damper blade with the damper shaft as its bearings, and an actuating cylinder moving the damper blade by an actuating equipment. A sealing profile made of silicone rubber is fastened to the damper blade by a leading bar. Upon closure of the damper, this sealing profile is pressed against the damper housing by means of an inflatable silicon tube which produces the sealing effect. The sealing profile provided with two double lips allows the tight seat of the damper blade on the mounted shut-off damper to be checked. The damper blade and the damper housing are made of stainless steel, the tube leading bars and profiles consists of aluminum. The control unit is placed on the head of the actuating cylinder. The shut-off damper is actuated from a customer provided switchboard cabinet. The media supplies needed by the control unit are electric energy as well as compressed air, 3 bar overpressure, oil free and waterless. The shut-off damper is actuated by means of a double acting pneumatic cylinder. The control unit ensures the proper sequence of motions including tube inflation and venting, respectively. The requirements on tightness as laid down in the German standard DIN 25 496 – Ventilating components in nuclear facilities - are more than satisfied. Several decades of experience gathered in the operation of shut-off damper systems in nuclear facilities and labs have decisively influenced the design and shape. Quite a number of references from various locations of shut-off damper installation have proved the high level of perfection attained by this.